Tammy Thompson monitors her daughters while they do their school work through North Carolina Virtual Academy. "This is a less stressful situation," the girls' mother, Tammy Thompson said. "You can see how laid back they are right now. They’re not being rushed to hurry up and finish this." Last school year, Thompson enrolled her three kids in North Carolina Virtual Academy (NCVA)—one of the state’s two virtual charter schools. Both have local nonprofit boards, but are managed by for-profit companies and receive public dollars to run. NCVA is managed by K12, and North Carolina Connections Academy is managed by Pearson. When state lawmakers decided to allow two for-profit companies to open the state’s first virtual charter schools, it was a controversial move. Many reports revealed the companies’ schools in other states were plagued by poor student outcomes and lawsuits. Online charter advocates promised things would go differently in North Carolina. But the schools’ first year of testing reveals the two virtual charter schools have the lowest growth scores of any school in the state. Despite the school's low state test scores, Thompson said NCVA is working for her family. Thompson, now retired, worked as a child nutritionist for 15 years in Harnett County Schools. She said the "brick and mortar" public school environment felt unsafe, and she thought students weren’t getting the attention they needed. "I came from a middle school, I know it was terrible," Thompson said, recalling teen pregnancies and drug sweeps. Thompson took her girls out of Johnston County schools and homeschooled them for a year before she put them in NCVA. She said she likes the flexibility NCVA gives her kids with their busy schedule of extra-curriculars, and she likes that she has total access to everything they're learning. "Not everybody can do this because you do have to be present with your kids," Thompson said. "But that doesn’t bother me, because [before] when they would come home with homework, I had no idea what they were doing...Now we can follow along with them and know where they’re at." 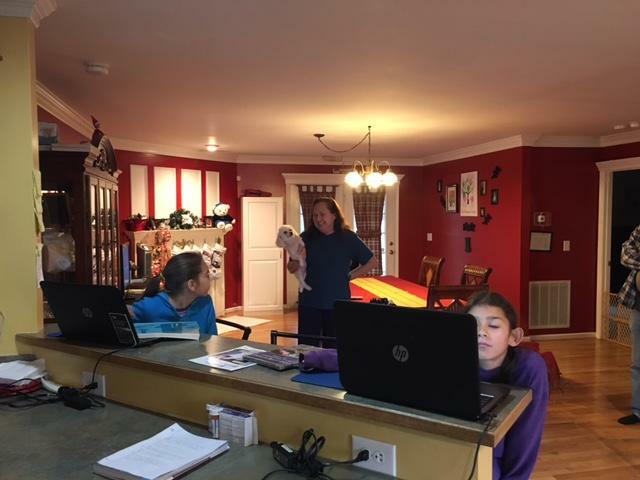 Thompson watches over the girls as they move from task to task, answering questions, grading quizzes and periodically checking into the parent portal on her desktop, the whole time with a small white dog tucked under one arm. At the breakfast table, eight-year-old Abigail Thompson clicks lightning fast through multiple choice math problems that appear on her laptop screen. She says she other kids picked on her when she went to a regular public school. "I did not like it," Abigail said emphatically. "I did not like getting bullied or called names, and sometimes I'd start to cry because they’d make me upset." Abigail said she makes friends through NCVA through the "open chat" feature of the computer program, and sometimes she uses the microphone to speak with other students. Thompson said Abigail is on grade level and making good progress. But not all virtual charter school students are doing as well as Abigail. 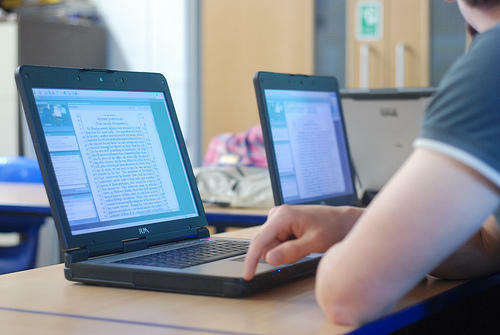 The state’s two virtual charters—NCVA and Connections Academy—fell far short of expected student growth on state tests. In fact, the schools are together at the bottom with the two lowest student growth scores in the entire state. "Are our scores what we wanted? They’re not, but we’re going to improve," said Joel Medley, NCVA's top administrator. He said many students came to NCVA already behind. And he said the school has added more staff and extra supports for students who struggle in math. Connections Academy said it's also working on a plan to improve math outcomes. Both schools point to letters of support they've received from happy parents, like Thompson. When it comes to the low growth score, Medley said he looks at growth differently. "If you talk to those families, the statements that they are giving us about the schooling that they are receiving this year compared to where they have come from—that’s the difference…that's part of the growth. If you have students that are behind, you can’t turn them around completely in one year, it takes time. And that’s all that we’re saying is give us the time with the four years," he said. Four years is the amount of time lawmakers gave NCVA and Connections Academy to run. Lawmakers call it a pilot program. But pilot or not, the program makes for an expensive experiment. The schools have collected more than $30 million in taxpayer funds. And they have more than 3,000 students statewide. Todd Ziebarth is with the National Alliance For Public Charter Schools, which has been critical of virtual charter schools. He said that’s a lot of kids to have on the line in a pilot program. "Those numbers are probably too high at least out of the gate," he said. "Why don’t we see if these operators can succeed maybe with a few hundred kids?" Ziebarth said he thinks the reason operators are starting out so big is because they want to make more money. After all, these are for-profit companies running these schools. The operators also hold sway with state lawmakers. K12, the company that manages NCVA, has five lobbyists registered with the state. By contrast, the state department of public instruction has one lobbyist. But Tammy Thompson said NCVA’s for-profit nature doesn’t bother her. Neither do its low test scores, even though one of her kids tested below grade level last year. "I see what my kids do daily," Thompson said. "That test does not say who my kids are—that one test at the end of the year." Under the terms of the pilot program, the schools can grow 20 percent each year, and both schools say they intend to do so. That means next school year, the two schools could enroll more than 4,000 students. Yesterday we reported that state education officials were expected to vote on whether to approve two virtual charter schools to open next fall. The schools would serve up to 3,000 students who would take all of their classes at home and interact with students and teachers online. Supporters have argued that it would help students who don’t thrive in traditional settings – especially those dealing with health issues, athletic schedules, or bullying.